Best walking tour around Kathmandu is including cultural heritage sights inside valley, naturally beautiful hillside, panoramic Himalayan views, walking through Shivapuri national park. Explore biggest Hindu temples, Buddhist stupa and visit monasteries. Stay relaxes in out of crowded at natural places with beautiful views. Walking tour is more suitable for beginners love adventure, family with child and old age peoples. Cost of the tours is depends on group size and category of hotels want to use during this tour. 2 days spend as arrival and departure, the real walking is 4 days. Day 01: Representative from Nepal Highland Treks pickup you from international airport and transfers to hotel. Your hotel is in Thamel, the touristic hub town. It is only 7 kilometer drive may take half hour. Rest of the time is for rest in Hotel. We offer you Nepali dinner with cultural shows at evening. ==> In case of you arrive at early time; we can plan to visit some interesting places near your hotel. Walking to Kathmandu durbar squire through Nepali local market. Rickshaw ride back to Hotel. Kathmandu durbar squire also called Bashantapur Durbar is royal palace of formal kingdom of Kathmandu. This is one of the three squires inside Kathmandu valley which all are listed in UNESCO heritage site. Squire is surrounded with spectacular architecture and different showcases which are all skills of Newari artist and craftsmen over several centuries. Kathmandu durbar squire, statue of Kal Bhairav. Kal Bhairav is one of the most dangerous forms of Lord Shiva and among the various forms of Bhairav. The literal meaning of Kala is ‘time’ or ‘death’, hence, Kala Bhairav is also considered as the ‘Lord of time or death. Second visit at huge Buddhist stupa, Bouddhanath and surroundings. is the largest stupa in Nepal and the holiest Tibetan Buddhist temple outside Tibet. 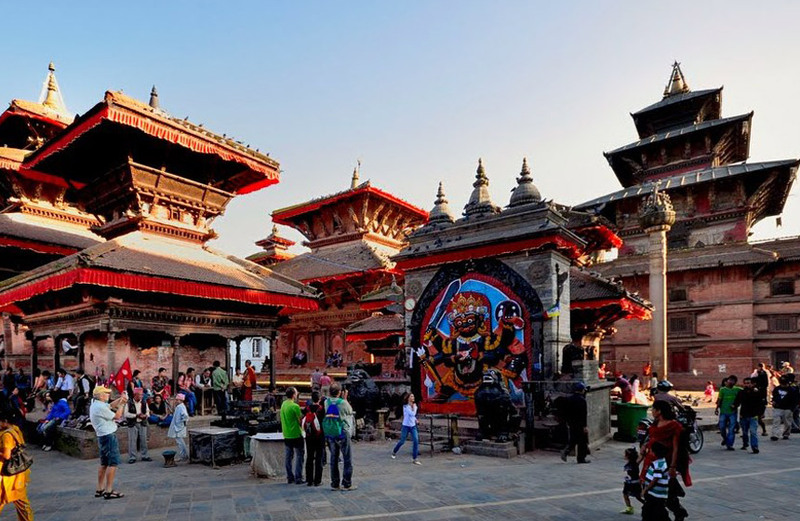 It is the center of Tibetan culture in Kathmandu and rich in Buddhist symbolism. The stupa was built in 14th century. Surrounding Boudhanath Stupa are streets and narrow alleys lined with colorful homes, Tibetan Buddhist monasteries, and street vendors. Third visit is to Bhaktapur Durbar squire, century oldest palace with history, richest arts and architectures. 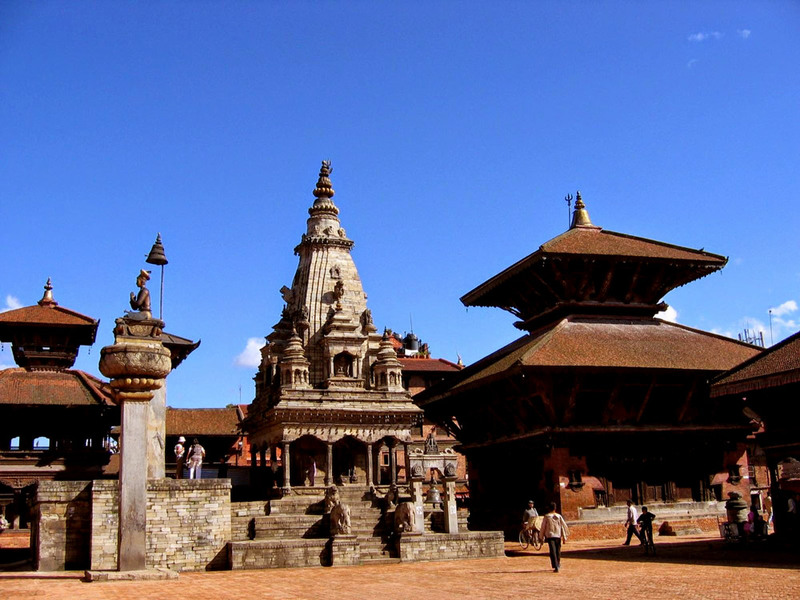 The squire complex consists of at least four distinct squares (Durbar Square, Taumadhi Square, Dattatreya Square and Pottery Square), the whole area is informally known as the Bhaktapur Durbar Square and is a highly visited site in the Kathmandu Valley. We Further drive to Nagarkot for overnight . 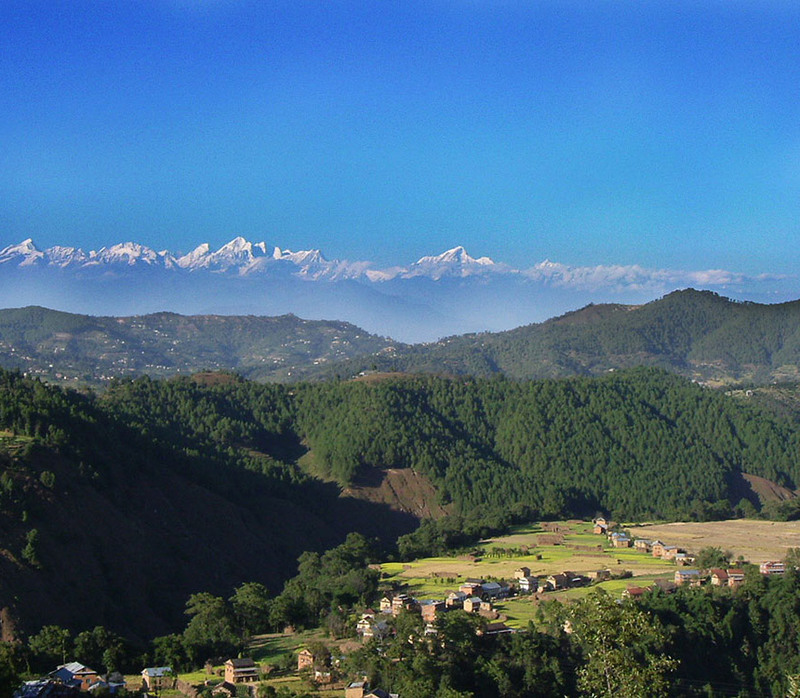 Nagarkot has a reputation as the top spot for enjoying Himalayan views and best sunrise. You can view from Hotel or very early in the morning, drive to Nagarkot view point to view sunrise and Himalayas. During clear weather, Langtang Himalayan range, Annapurna, Everest Himalayan range and other are visible as far view. Back to Hotel for breakfast and walking to Dhulikhel (4 Hours) Hiking through forest of National park, local villages, terrace field and peoples. Dhulikhel is another hill side and more popular places from which to observe the high Himalaya and nice valleys. From the edge of the ridge, a stunning panorama of peaks unfolds, from Langtang Lirung (7227m) in the west, through Dorje Lakpa (6966m) to the huge bulk of Gauri Shankar (7134m) and nearby Melungtse (7181m), and as far as Numbur (5945m) in the east. Day 04: Stay relaxes and scenic place and walking to another hillside through scenic landscape of terrace field, local villages, temples and monasteries. Overnight at simple reort at hillside. Till mid morning, stay relaxly in the Hotel. From Dhulikhel it is 3 hours walking to Namobuddha. A famous and biggest monastery at the hill station with the views of scenic mountain range and villages. At the top of hill in Namobuddha lies magnificent Thrangu Tashi Yangtse Monastery . A Tibetan Buddhhist temple with sprawling monastic complex which was officially open for the tourist in 2008. Namobudhha is one of the three most important Buddhist pilgrimage sites along with Boudhanath and Swoyambhunath. Further walk to Balthali Village. Enjoy local meal and local wine from the village. Relax time after hiking 2 days in the resort. Balthali offers a sunrise in the east, speculating Himalayan range of Manaslu, Langtang & Everest in the north, innumerable rice terraces in the west & huge bodied green forest of Mahabharata range in the South. One of the most important factors of this spot is that it is warm in the winter & cool in the summer. The area of Balthali is cover of various flora, colorful rhododendron forest, and magnolia & Sal trees. After full morning stay at Balthali, we walk half an hour to Panauti and drive back with our car to Kathmandu valley. Visit Swoyambhunath and Kathmandu Durbar squire if we do not have visited before. Rest of the time is for free for shopping. You are free to customize your tour plan. If your want to change some from our 6 days walking tour plan, you can suggest us to add or remove. As per your interest we will suggest you best customize plan again. You also can plan longer days or even make short days walking plan around Kathmandu. Best season of walking tour: You can plan this walking tour throughout the year. Although, the best season is from March to June and September to December month. Month of July and August will be disturbed by rain and sleeper walking path. Month of Jan and Feb is cold month but still good than walking in raining months.